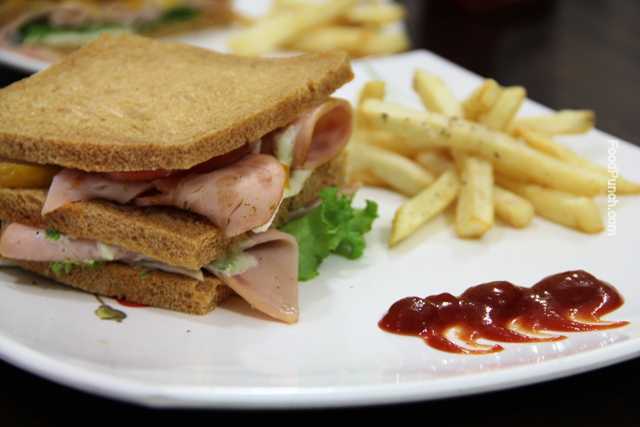 I enjoyed my sandwich with a cup of fine black coffee but he preferred a quick cold coffee and some French fries as his add on (while I was busy arranging the sandwiches he sneaked out to the nearby ‘In & out’ outlet and returned with the frozen ready to eat pack of French fries.). PS- I did pick some fries from his plate, unable to resist the temptation, and he kept pulling is plate back every time he saw me reaching for it. 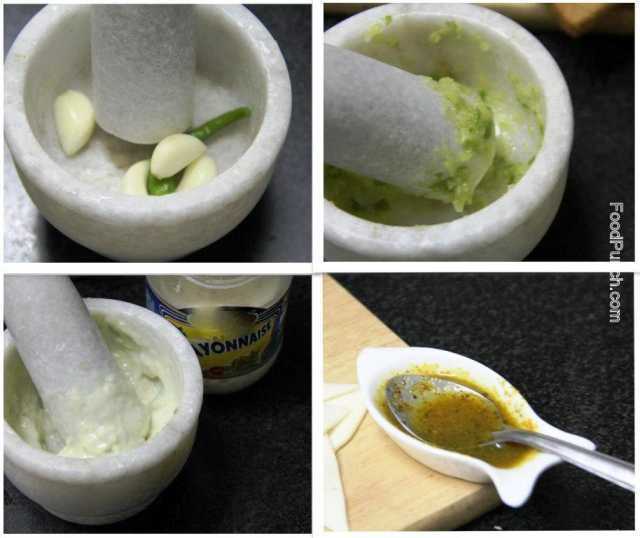 Crush garlic and green chilies coarsely overusing a mortar and pestle, add 5-6 drops of extra virgin olive oil and the mayonnaise , mix well and fill in a squeeze cone else just make a pot folding the mixture in a cling film, cut a small hole at the centre and use as your sqeezy cone. Cut the hard corners off you bread loaf, lay the diagonally cut cheese slices on four loaves and toss for 30 secs only. Now spread two loaves on your work surface. 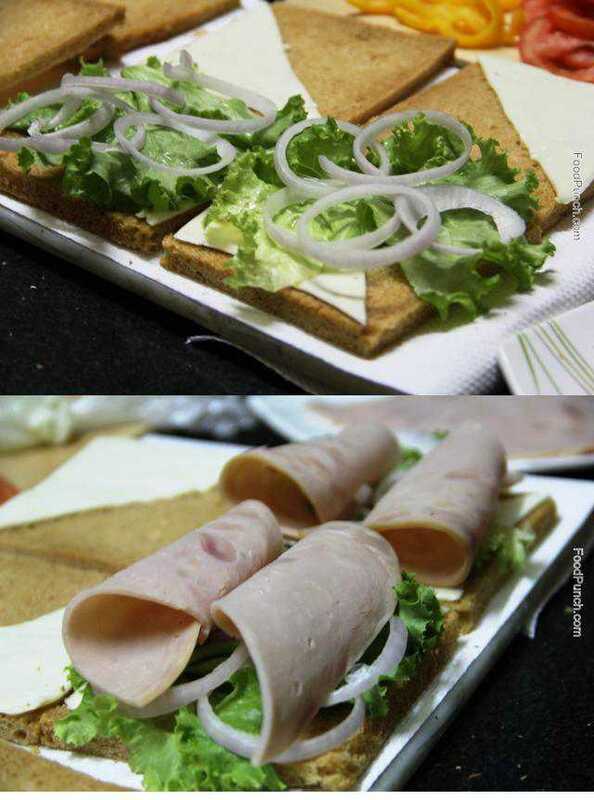 Place a lettuce each, then some onion rings, followed by the ham slice. 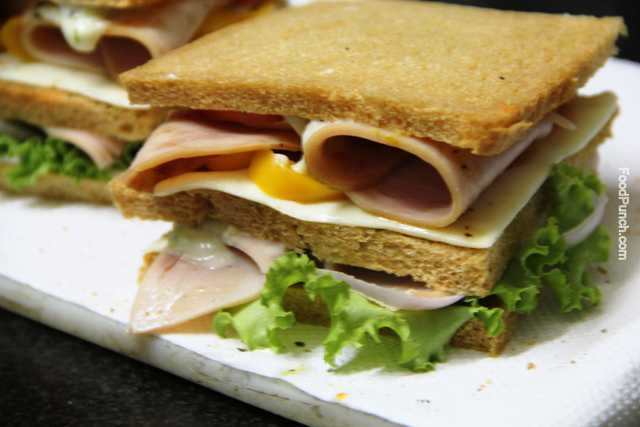 Now you may simply place one ham slice flat or cut each into diagonal and then fool round to make a hollow cylindrical shape and place tucked side by side. Now squeeze ¼ the of the mayo dressing over it, sprinkle salt and pepper. Then place each cheese tossed bread over it such that the cheese is facing upward and is in the opposite diagonal area as on the first bread. 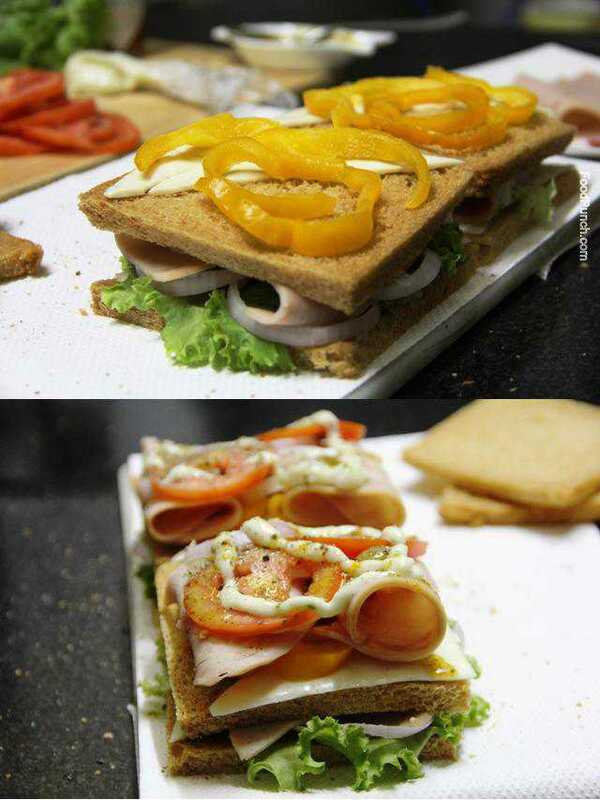 Line up with some bell peppers, some more onion rings, chicken ham slice folded or flat, two tomato slice over each sandwich, the olives. 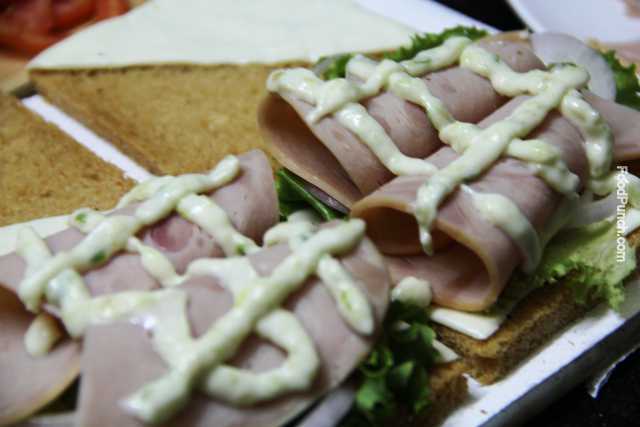 Finally squeeze ½ of the remaining mayonnaise over each, followed by a teaspoonful of honey-mustard dressing, sprinkle salt, pepper and add torn basil leaves. Finally cover up with the reaming two plain loaf of bread and serve with tomato ketchup and French fries. Feel free to add or reduce more veggies or cheese or choose any other dressing that you like. Well you may grill your sandwich before serving, I find it unnecessary though. Don’t overload the sandwich I’d suggest, for it may difficult for the bread to hold it all. tried these its amazing….lovely blog with amazing mouth watering pics…continue the good work!! Thanks a lot Fazila..I am so glad you liked my work.. Your comment is a great motivation to keep going..
Must apologize for the late response, have been inactive due to a broken ankle and bad internet connection for last one week.. Waiting to hear from you on our other recipes too.. Sounds like a unique idea Vivek.. I’d love to hear how it turned out?? Yet again, you and your recipes just never fail me. It was a 10/10 for breakfast today. If I lived in your house, I would have been a fatso all my life. Cheers to the good food and a great chef. Really want to try the recipe out but just want to know what you mean by “Cut the hard corners off you bread loaf,” do you mean the crust? “toss for 30 secs only.” Do you mean toast the bread? I’m sorry if I sound rude I just want to clarify what you mean as I want to try the recipe. Thanks!